When a local bus started flooding, the passengers onboard started to rush to higher ground. Except for one brave old lady. 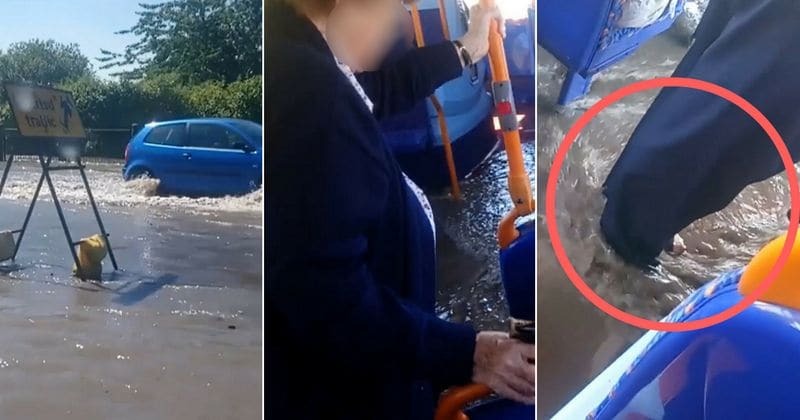 This is the moment a stubborn 'little old lady' refused to budge despite a torrent of water turning her bus into a swimming pool when the driver plowed through a raging flood. 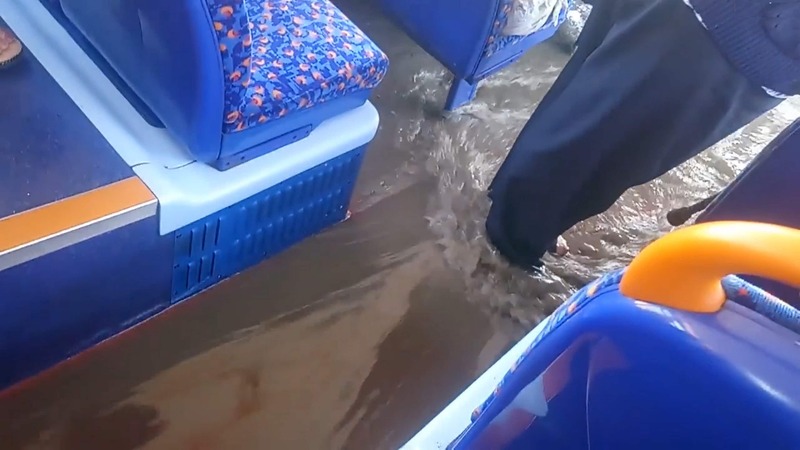 Cassie Mason, 39, was on her morning commute through Newcastle last week when the bus, believed to belong to Stagecoach, encountered deep flood water from a burst mains pipe. According to the Kennedy News, the support worker claims the driver was faced with the dilemma of becoming stuck or driving on through the rising water - and he plumped for the latter. Shocking video footage shows the water begins to come on board through the bus' doors until eventually the entire vehicle's floor is submerged in dirty water. 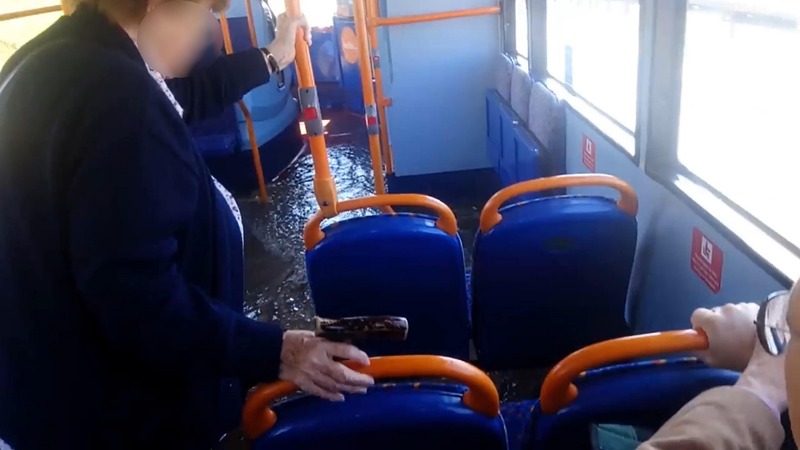 Commuters can be seen fleeing to the back of the bus as the water rises in a bid to remain dry - but one daring 'little old lady' remains unfazed and braves the water as it sloshes past her ankles. Cassie claims the lady even declared that the 'lovely' heatwave weather would help her dry off and 'not to worry' as she was only wearing sandals anyway. She says the driver had to break multiple times with the doors open in a bid to try to send the water hurtling back out of the vehicle. But his clever trick was not completely successful and one new passenger was allegedly greeted with a soaking for their feet as the doors opened for them to board. Cassie, who lives in Gateshead but travels into Newcastle for work, said: "As we got to the roundabout near B&Q I started seeing the water around but the driver couldn't turn round. "He was either stuck there or he had to just go for it and go through the water. So he decided to go for it. There were people going around the roundabout the wrong way trying to get away from the water. It was chaos. I couldn't hear what the driver said but you could tell he was faced with the dilemma," Cassie said. 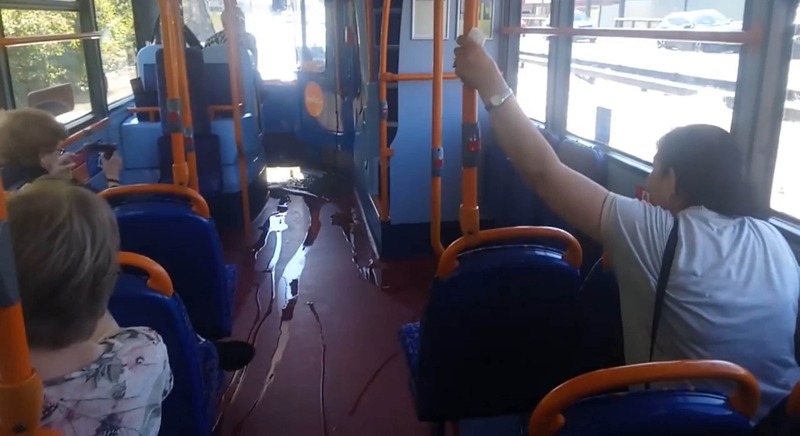 "He made a call to the bus company and presumably informed them it was flooded and that he was going to have to go through it. At first, it wasn't too bad and only a little bit of water came onto the bus. So I just lifted my feet up and thought that was it. But then as we came around the roundabout there is a bit of a dip so that was when it really caught all the water," she said, "It came flooding in through the front doors. I was sat right at the front so I ran to the back seat." "There was this little old lady so I said if she kept her feet up she would be alright. But she was like 'no, no, not to worry' and stayed stood up in it. Bless her, she was saying 'I'm fine, I've only got sandals on. They will dry in this heat, it's lovely'." One of the girls behind us was shocked and said she had never seen anything like this before,' said Cassie. "The little old lady definitely got wet, but a few others who lifted their feet up late also got a little bit wet. I don't think the driver even realized just how much the water would come onto the bus. It caught everyone by surprise - I have never seen anything like that before." The flood is believed to have been caused by a burst mains pipe, which Northumberland Water worked throughout the morning to fix by around 1 pm. Cassie says that most of the 10 people on board managed to remain dry by clambering up onto the seats - but not the old lady. Cassie said: "I think the flood had only happened about five or ten minutes before we came down the road. Thankfully I didn't get wet because I ran to the back of the bus and kept my feet up. The driver kept breaking with the doors open to try to 'swoosh' the water about to try to get it off the bus. When we pulled up at the next stop, a lady was about to get on and the doors opened and water went over her feet. You could hear her exclaim in shock. The driver warned her to be careful it might be slippy." Cassie also explained the reason behind the flooding: "There had been another bad burst pipe around a month ago or so and that fired 50ft in the air or something. That put the bridge I usually use out of action so that's why I was going on this particular road." Steve Walker, managing director of Stagecoach North East, said: "Safety is our absolute priority and our drivers are professionally trained. We take guidance on road conditions from the police and local authority and on this occasion, the road remained open to traffic. We will look into this particular incident with the driver involved to determine the full circumstances." Northumberland Water was contacted for comment.